Offers web hosting plans for individuals and businesses. Located in Plymouth, UK. Malaysia hosting provider that specializes in application hosting, budget hosting, basic hosting, email hosting, premium hosting, commerce hosting, dedicated hosting, and co-location hosting. India Web hosting, Windows hosting, linux hosting, Hosting control panel, e-commerce, shopping cart, Payment Gateway, Cold fusion hosting, Java hosting, ASP hosting. Interviews with web hosting providers that offer reseller web hosting services, and articles on reselling web hosting. Offers shared web hosting and reseller hosting with FrontPage, MySQL, PHP, Python and Perl supports. Provides shared web hosting and dedicated hosting services. Based in Victoria, British Columbia, Canada. Provides multiple plan web hosting featuring the Hsphere Hosting Control Panel and domain name registration. Offers shared web hosting,e-commerce hosting solutions and domain name registrations. With support CGI/Perl, PHP, ASP.NET. Web hosting company offering a wide range of solutions: web hosting and domain name registrations. Offers several hosting options, email hosting, domain names, control panel, site design. Offers Windows hosting and Linux hosting, and supports Microsoft FrontPage, ASP, PHP, MySQL. Also provides domain registration. Delivers shared hosting, dedicated servers and colocation solutions in a Chicago hosting & data center. Offers web hosting, web design and web development. Windows hosting including ASP.Net, and Linux hosting. Provides IRCd hosting, bnc hosting, eggdrop hosting, shells, downloads and online support. Offers ASP.NET web hosting, dedicated and virtual hosting, domain name registration and DotNetNuke. Australian web hosting company provides Unix and Windows hosting with reseller web hosting plans. Simple and quick answers to web hosting questions. Created specifically for beginners who may feel intimidated by the complexities of web hosting. Globalnet web hosting, website design, and e-commerce merchant account provider. Also offering anonymous reseller web hosting services. Australian web hosting service, offers domain name registration, shared or dedicated hosting and co-location services for businesses. Offers shared hosting, reseller packages, domain registration, application hosting and support. Based in Toronto, Canada. Provides managed dedicated hosting, shared hosting and reseller hosting. Offer shared web hosting, reseller hosting and domain registration. Customizable web hosting plans and reseller hosting. CPanel comes with every account. Provides web hosting, reseller hosting and domain registration. Rates web hosting plans and hosting providers. Web hosting packages on Windows 2000 and Linux servers. Domain name registration and parking available. Each hosting package includes Hsphere control panel, POP3, web mail, CGI, PHP, SSI, SSL and FrontPage extensions. Offering shared hosting, dedicated servers, and co-location. Supporting Linux hosting, managed and unmanaged servers, and reseller hosting. Provides a full array of web hosting, DNS hosting, software development services. Web hosting including ASP, ASP.NET, Perl 5, CGI, SSI, SSL, FrontPage Extensions support. Eggdrop hosting and Unix shell accounts with extra options like Custom Vhosts, Private IP address, and eMech accounts. Web hosting and DNS hosting is also available. Linux and NT hosting, with shared and dedicated servers. Shared hosting features include shopping carts, ColdFusion, MySQL, MSSQL, Access, PHP and ASP. If the business hours of NAC Web Solutions in may vary on holidays like Valentine’s Day, Washington’s Birthday, St. Patrick’s Day, Easter, Easter eve and Mother’s day. We display standard opening hours and price ranges in our profile site. We recommend to check out nacwebsolutions.com/ for further information. 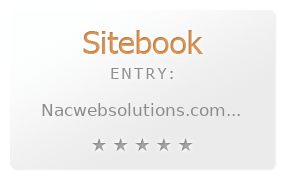 You can also search for Alternatives for nacwebsolutions.com/ on our Review Site Sitebook.org All trademarks are the property of their respective owners. If we should delete this entry, please send us a short E-Mail.